So F1 qualifying still sucked. I’m still awake and thought it would be a good idea to tweet my idea to every driver that has a verified Twitter account. I also sent it to the Ferrari account. If any team were to at least threaten to pull a stunt like this, it would be them. There’s no way this would actually happen. If all the drivers did this, what’s Bernie going to do? Cancel the race? That would cost him too much money. A protest in place of qualifying would have already cost him. Advertisers and sponsors would be furious. They’ve got to be pissed enough as it is already. This would have them breathing down Bernie’s neck. They’d be forced to change it back. But you never know. 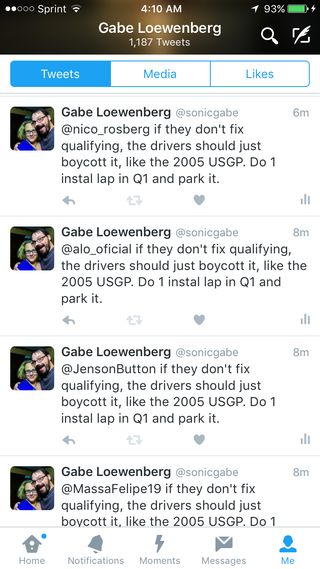 Two drivers start talking and joking about this dumb tweet they got (that would be my dumb tweet). A few other join in and all of a sudden, the idea doesn’t seem that crazy. They start talking about the logistics and ramifications.